After winning his third start in 2017, RAHEEB went amiss and had to miss the whole of last season. 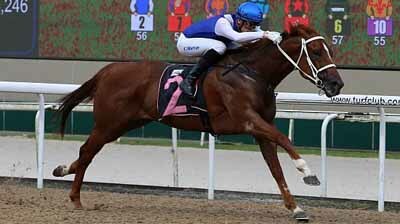 Following a change of trainer this year and two runs back in February, RAHEEB regain his winning form when he romped to an easy win in the Novice - 1200m sprint on the polytrack at Kranji here today. Ridden by Callan Murray, the New Zealand gelding was the early leader but his South African jockey allowed FEDERATION to take over and sat on his outside till the top of the straight. RAHEEB hit the front 200m out and cleared away in the closing stages to win by 2 3/4 lengths. After his long spell and two unplaced run on return, he was unfancied in the betting and paid $151. "That horse trialled very good the other day, but we thought he might still need the run," said Murray. "It’s good to be back a winner. It’s been a long time between two beers." Murray began his 10-month stint in early March and rode a winner GANASSI, who coincidentally also caused an upset, on his second day. He has not ridden another winner till today.